Spink, London, 2012. Crown quarto, hard cover, pp. xii, 360. Well illustrated throughout in colour. Paul Stevens and Randy Weir have combined their extensive knowledge and experience totalling over 60 years to produce this comprehensive handbook for collectors. They have amassed information from numerous sources and have gathered together superb photographs, all shown at 1 ½ times actual size, not only of the currency issues, but also of Proof Restrikes, Early Proof Restrikes, Original Proofs and rarely seen Patterns. Also shown are close-ups of varieties and line-drawings to illustrate points that could not be easily shown in photographs. Information about weight, diameter, metal, edge and axes is also given with cross references to Pridmore numbers with additional comments to show provenance. 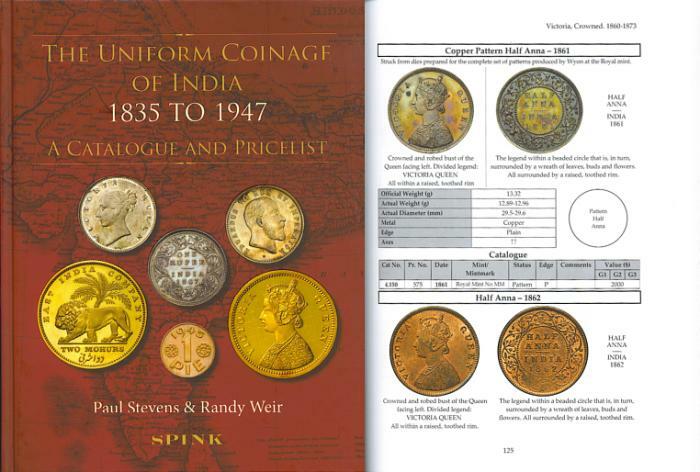 This is the new standard catalogue for the coins of British India for the period and includes prices in US$ in multiple grades together with mintage figures. The Uniform Coinage of India 1835 to 1947. A Catalogue and Pricelist. This catalogue provides an authoritative guide to the different major coinages of William IV, Victoria, Edward VII, George V and George VI and includes detailed colour illustrations of each coin. This work is based upon that of Major Pridmore (The Coins of the British Commonwealth of Nations. Part 4 India. Volume 2, Uniform Coinage. Spink & Son Ltd, London 1980) and has been authored by Dr Paul Stevens and Randy Weir. Although primarily a collector Paul has spent many hundreds of hours in the British Library exploring the history behind Indian coins, particularly that found in the archives of the East India Company. Randy keenly buys Indian coins for inventory and believes that this beautiful series of coins is very affordable when compared to other world coins with plenty of scope for collectors. It is with this in mind that he co-authored this reference book to share his wealth of knowledge, experience and passion for these coins with collectors both old and new.